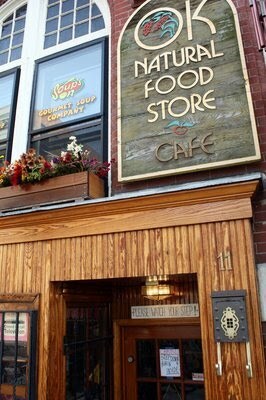 We're a small, Family-owned Baltimore Natural Grocery that's been in business for over 30 years (established in 1978). Located in Mid-Town only 2 blocks from MICA, the University of Baltimore, and the Meyerhoff Symphony Hall. We focus on whole grain foods. Lots of organics, vits. and supps., with bulk foods as well as bulk herbs and spices. Prepared vegetarian sandwiches/ spreads/ dairy products/ veggie versions of dairy products/ fresh bulk tofu/ many vegan options. We have a highly specialized " Macrobiotic Food" section with the highest quality seasalts, misos, umeboshi, seaweeds, and other medicinal imported Japanese foods. A wide variety of your grocery needs; beautifully and efficiently arranged in our 800 sq. ft. (barely) space, that looks and feels like it's right out of the 70's, because it is. There's a small produce section (organic and/or local). Plenty of snacks, chocolates, teas, coffee, health and beauty products, essential oils, incense and candles . Great specials (including a 40 - 50% off shelf w/ BIG DEALS we pass on to U !!!) Friendly staff (most of the time) some willing to talk to you for hours, and to order what we don't carry. Community Bulletin Board as well. [no awesome vegan donuts - inside joke] PEACE !!!!!!! !